AFTER THE BIG CELEBRATION: Everyday playground routine sets in – An unemployed sandman – Thank you and good bye! Early in the morning of the grand opening, the last traces of two months of construction work are being obliterated. Everything is supposed to be immaculate, when the festivities start. For this purpose, half the village seems to be on its feet very early in the day – in every corner there is someone scrubbing, sweeping and polishing. As always the little ones are lending a hand. No matter how hard any blade of grass might try to hide in the cracks of a curbstone, it gets tracked down and plucked out without mercy. And if you have to sweep the road twice as fast, the boy with the two brooms developed the proper technique. Even the local fire brigade is helping out with its professional equipment to eliminate the tiniest speck of dust from the pavement. ...this picture stirs up reasonable doubts about his competency. However, maybe it’s just that the installation instructions were incomplete. Here you go! The tent stands upright, tall and straight like the Eiffel Tower. Under its protective roof delicious cakes, cookies and tartlets prepared with love by Pobiedna’s housewives will soon be served. Everything on the playground and around the playground is being decorated with a great deal of balloons and ribbons in all colors of the rainbow. The master of decoration, Benedikt, has just put up about a billion balloons, but there is still no end in sight. Fancy lampions and paper flowers embellish this little tree. Most of the pretty decoration items have been designed and crafted by the children of the village and members of the LCP crew throughout the last couple of days. Pumping up about two times 99 balloons with helium gas takes its time. Once they are inflated, make sure to hang on to them real tight, because they are eager to take off and they don’t care for permission. Let’s hope the young lady on the photo has some weights in her pockets, or at least had a good breakfast this morning, with a sufficient amount of fiber. Finally all waiting comes to an end: On the stroke of 15.00 o´clock Central European Time our charming conférencier Krzysztof goes on stage and opens the celebration with a buoyant welcome monologue. Krzysztof introduces three of this afternoon’s most important notables. …the truth is, that they are facing a large audience and its big expectations, as this different perspective makes clear. There’s no inauguration without a ceremonial oratory. 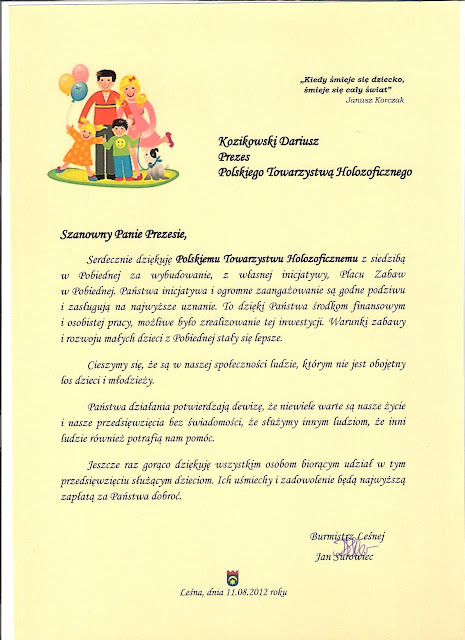 The mayor of the town Leśna, Mr. J. Surowiec, starts, followed by the chair woman of Pobiedna, Mrs. A. Hałas – both already known to attentive blog readers – and last but not least our Darek in his function as president of the Holosophic Society Poland. All of them find moving words of gratitude and appreciation and here and there in the audience a little tear is dashed away from the corner of the eye. But who wants to hold that against anybody on a heart-rending occasion like this one? 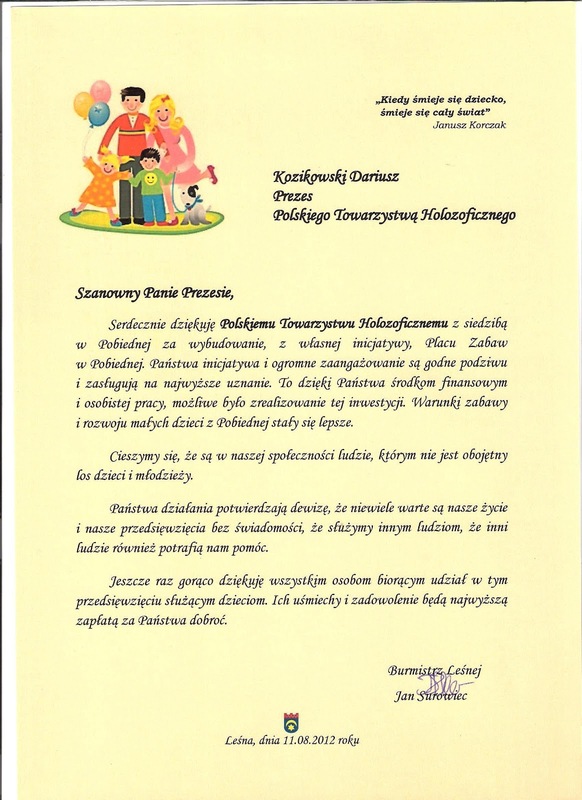 I would like to thank the Polish Holosophic Society situated in Pobiedna, for building the playground in Pobiedna on its own initiative. Your initiative and huge commitment are worth admiring and deserve the highest praise. It is thanks to your funds and physical work, that the realization of this investment came into being. The playing conditions and development of the small children in Pobiedna became much better. We are happy to know that there are people in our community, to whom the fate of children and youth is not indifferent. Your actions confirm the motto that our lives and ventures are worth little without the conciousness, that we are serving other people, and that other people can also help us. Once again I would like to thank all the people taking part in the project serving children. Their smiles and contentment will be the highest payment for your kindness. for the selfless help, kindness and generosity. Next thing on the agenda: Presenting thank you certificates to those villagers, who showed an outstanding commitment for the good cause. Nobody had expected anything like this and all of the honorees were very happy about this appreciative commendation from their home village. Subsidiary for all small co-workers, this quartet is also being honored. Since for a child an official commendation is even more special as for an adult, the certificate will surely receive a special place in the children’s room. But the four kids do have every reason to be proud of what they have accomplished. There are not many children around, who are in a position to claim to have contributed to such a significant extent to the construction of their own playground? Many times there is well-deserved applause for all protagonists. „There’s not a thing I miss, I could get used to this…“ the scissors rhyme in disbelieve. Honestly: Would you not love to become the focus of attention like that just once? The most indispensable utensil of this afternoon, freshly sharpened, brightly polished and bedded on red velvet, is getting ready for it’s great entrance and the most significant moment of the celebration. 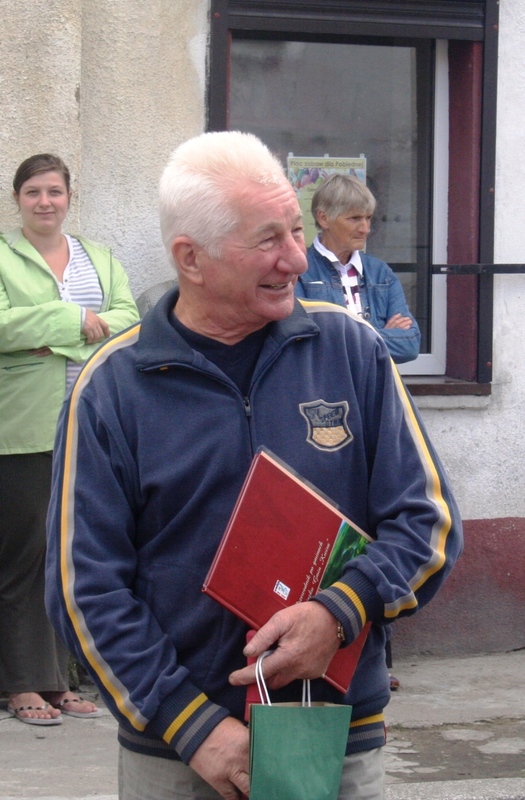 It’s so quiet you could hear a pin drop, when our little scissor-girl (hidden behind Mr. Surowiec) carries the tool across the street to the mayor and the village-president. All eyes are focused on her – any small stumbling stones please move out of the way NOW! They did. And the sweet little girl performs her responsible task with ease – her mom can be proud of her. Now it’s up to the three dignitaries who share the central part of the ceremony, to perform their task in the same confident way as she did. The audience rises from the seats: Nobody wants to miss this historical moment. The village president, Mrs. Hałas, is the first to carve into the red ribbon, which still obstructs the juniors the access to their new playground. Now let’s hope that the village’s scissors grinder knows his craft. Then Mr. Surowiec, the mayor, follows. The routine he operates with reveals: It’s probably not his first opening of a public facility in his carrier. Quickly, the second third of the ribbon is being cut through. …snap…a final cut and it’s done! The ribbon has been cut through entirely and finally gives the playground entrance free for good. It might be just a short moment in the history of Pobiedna, but a very important one for all the young inhabitants of the village. There is no stopping them anymore – the little rascals are storming their playground so furiously, they almost run over Darek. Although the kids had already tested the gear during the past days, it’s still different to be one of the first users OFFICIALLY, and thus go down in the books of history. ...by far the longest queue builds up at the cableway. It is not very likely that this device will get a pause before dark. All the little Tarzans just can’t get enough of gliding from left to right, back and forth, again and again, accompanied by loud yelling and screaming. And encouraged by a coffee-drinking and cake-eating crowd, which also seems to have it’s share of pleasure – whereas, when you come to think of it, the one or the other would probably like to put the cake aside and take a ride himself. But this is by far not the only highlight of today’s celebration. The program is rich in variety and has more attractions to offer. For instance the folkloristic choir of Pobiedna: Dressed in traditional costumes, they entertain the audience with polish folksongs from their large repertoire and thus contribute to the cheerful atmosphere. And if you happen to have a sweet tooth (who hasn’t?) the magnificent buffet of cakes, pies, tortes and cookies offers everything the heart desires. Yet another long queue. What is it, the stranded young fisherman is after, when there is far and wide no pond or lake in sight? Well, there is no reason for any of our finny friends to worry about its health. It’s just the internationally well-known game “lucky dip” that is causing this rush. With skills and a smile from Lady Fortune, you may ensure yourself of your ration of sweets for the next couple of weeks. Another one of the children’s places in favor is the face painting beauty salon. All it takes is a few strokes of the brush and a little patience to be transformed into a tiger, a butterfly, a cat, a beautiful princess or into your favorite superhero. Apart from that you can catch a breath while taking a little break from all the excitement and running around. Warning! This goes out to all gangsters, thieves, lawbreakers and criminals (even smooth ones), who are up to no good: You better crawl away into your deepest hole, if you know what’s good for you, cause Spiderman and Catwoman are in town! Good gosh! What the heck is this? ET’s transparent grand nephew from another dimension or a parallel universe? Or how else would you interpret this mysterious phenomenon, which is soundlessly trying to sneak up on us out of nowhere? On top of that it is able to reproduce itself real quickly – probably by some form of cell division. As if that weren’t enough the strange thing seems to have had an insufficient breakfast. Why else would it try to engulf two and a half kids at one go for an afternoon snack? But now it went too far! The children cannot tolerate such antisocial behaviors. And after a brief moment of bewilderment, they pull themselves together, pool their strengths and start a counter attack. … finally the spooky creature comes off second best. It did not reckon with that much resolute resistance and decides to slip off to wherever it came from with a loud puff. If that bizarre thing didn’t succeed to spoil our party, why would a short sharp rain shower do? After all, nobody wants to miss the final attraction of the festivities: The great balloon contest! The rules are simple: All children, small and bigger once, take a balloon and attach a card with their name and address. In such a way equipped, the balloon is being sent off on its trip. When the balloon eventually goes down, wherever that may be, the person who finds it can possibly send the card back to Pobiedna with an indication of where it was found. The owner of the balloon, which accomplishes the longest journey is the winner and will receive a price. Looks like the balloons just can’t wait to get turned loose. Finally the moment has come: One, two, three, go! And off they are on their long journey to faraway shores. Bon voyage! Here we go! The vast blue Skye is the limit and is calling those who were born to fly. Quickly the balloons vanish, blown away by capricious winds. Nobody knows their aim. It may be Oslo, Rio or Tokyo, Timbuktu or Katmandu, Newfoundland or Nova Scotia, Bora Bora or Papua New Guinea. Maybe it’s Winnipeg, Novosibirsk or the Lake Titicaca, the Ivory Coast or the Cape of Good Hope, nobody knows. Possibly a balloon travels all around the world, just to go down in the neighboring village of Pobiedna – but it’s owner wouldn’t appreciate that too much for good reasons. Soon some tiny dark spots against the pale clouds are all you can see of them and then, one by one, they disappear from view completely. But tonight before falling asleep, the thoughts and dreams of every little child in Pobiedna will travel with them, whatever mighty mountain or deep blue ocean they might fly above right then. „A warm thank you for the wonderful playground!“ say the words amidst of this object, surrounded by a few dozen colored paper hearts with the names of a lot of children of Pobiedna. A lovely, spontaneous gesture of gratitude, from our new little friends, addressed to the LCP and the whole playground team. And a very nice surprise at the end of the festivities, which comes totally unexpected and which alone was almost worth the whole effort. Every celebration comes to an end. In the late afternoon, the, so to say, daily playground routine sets in. But for the children, for a long time to come, every day on their playground will be a Sunday. The sandman will be wondering, why the little ones in this small village in the Southwest of Poland will make his job so easy tonight, for they will have fallen asleep even before he had a chance to sprinkle a single grain of dust into their tired, but happy children’s eyes. We have come to the end of our blog. We hope that throughout the past two months, we have succeeded now and then to beam a little bit of the vibe, the feel and the atmosphere from our construction site to you, into your homes, onto your PCs. In your minds you conquered mountains of gravel with us, hiked through bleak sandbox-deserts, dug deep dark tunnels and have replanted at least one football field of grass from A to B. For this, for your attention and for the many clicks in many countries, we like to say: thank you so much! It has been a pleasure and we hope you enjoyed it too. For the last time now, we send greetings from Pobiedna out to you, wherever you are and, who knows, maybe see you soon at LCP! P.S. Don’t miss this: The link below leads you to the website of the village of Pobiedna. There you can view many gorgeous, professional photos of the playground-opening event. Check them out, they’re great!